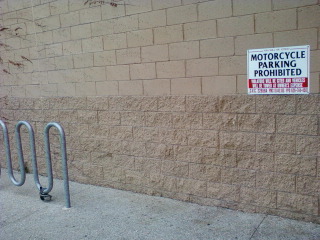 My gym in north Pasadena has a serious parking shortage. It’s not uncommon for cars to have to wait in line to get a parking spot. The 24 Hour Fitness shares a lot with several other establishments, including a Subway, and a Kings Market across the street. Starting in the early morning, and until late in the evening, parking spaces are at a premium. So what has my gym done in response to this problem? They’ve made it worse. Instead of encouraging motorcycles to park on the ample sidewalks or in the bicycle parking, they’ve posting “No Parking” signs in these areas. So now, instead of freeing up extra spaces for cars, they’ve managed to create an even bigger parking cluster. According to several in attendance at last weekend’s ABATE meeting, this is a growing trend throughout California. The big question is why? There is no safety concerns at play here. I don’t know of a single instance of a motorcycle accident being caused by a rider pulling up to a bicycle parking area. It comes down, once again, to anti-biker and anti-motorcycle bigotry. 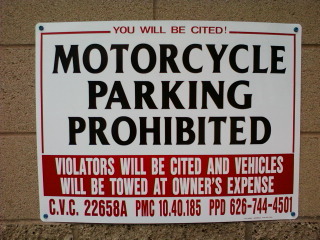 I asked for a reason for the “no motorcycle parking” signs. At first, the answer I was given was a bold-faced lie. “It’s illegal for motorcycles to park on the sidewalk,” I was told. I explained that, in fact, I was a motorcycle accident lawyer, and an expert on motorcycle laws, and that it was not illegal when the so-called sidewalk in question was public property. Rather, according to the California Vehicle Code and the Pasadena Municipal Code (as well as most other cities in California), it is up to the owner of the property in question. After some himming and hawing, I got the answer that I already knew. “Well, no, it’s just . . . it’s not my decision. Take it up with the owner of the building,” the manager said.